Some clients are so fashion-forward that they must be able to slip in and out of a new nail color at a moment’s notice. But of course, those same color-obsessed clients will be devastated if their chosen shade chips in just a few hours or days. CND’s Vinylux launches with 62 colors (30 of which are matched to the company’s popular CND Shellac shades), and each is applied to the nails without any base coat. No UV lamp is needed either. The Vinylux Weekly Top Coat is formulated to become more durable when exposed to natural light, helping prevent those pesky chips from occurring. According to CND, Vinylux Weekly Polish dries in eight and a half minutes and removes with acetone-based polish remover in just one minute. Be the first to carry it as Vinylux launches to salons this month. 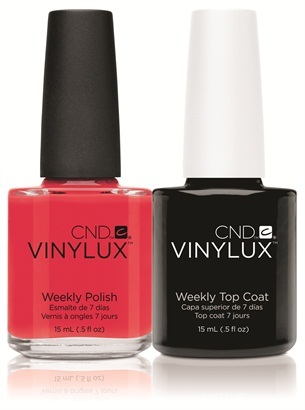 To watch a teaser video for CND’s Vinylux Weekly Polish, go to www.nailsmag.com/video/vinylux.